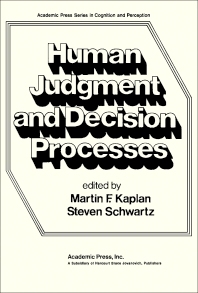 Human Judgment and Decision Processes is a collection of papers that covers the various theoretical frameworks that relate judgment to decision making. The book is comprised of 10 chapters that cover both mathematical models involved in decision making and interpersonal aspect of judgment process. The first five chapters cover papers about decision making. The subjects of the papers include multiattribute utility measurement for social decision making; portfolio theory and the measurement of risk; and information-integration analysis of risky decision making. The other half of the text deals with the judgment process, which includes topics such as interaction of judge and informational components; judgment and decision processes in the formation and change of social attitudes; and the role of probabilistic and syllogistic reasoning in cognitive organization and social inference. The book will be of great use to psychologists involved in research on human judgment and decision process.